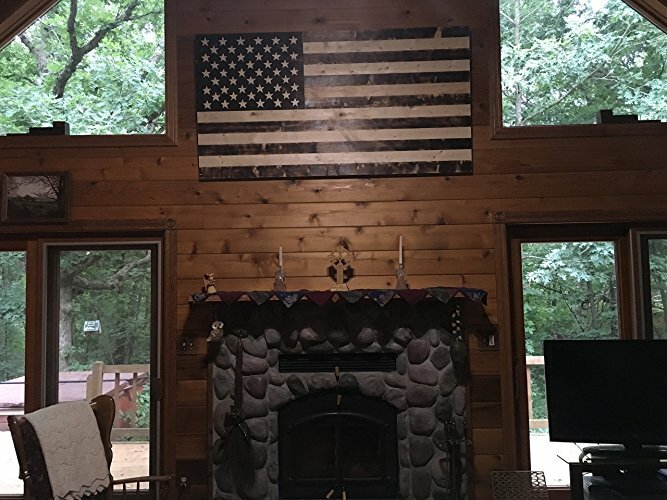 Displaying our beautiful red, white and blue American flag in our home is very, very important to me. I’m proud to say that I don’t just fly “Old Glory” on Memorial Day, or the Fourth of July. No way, uh uh, not me. I do it all year, every year. I have one hanging on our front step right now, and I also move this 21 x40 inch wooden beauty all over the house. 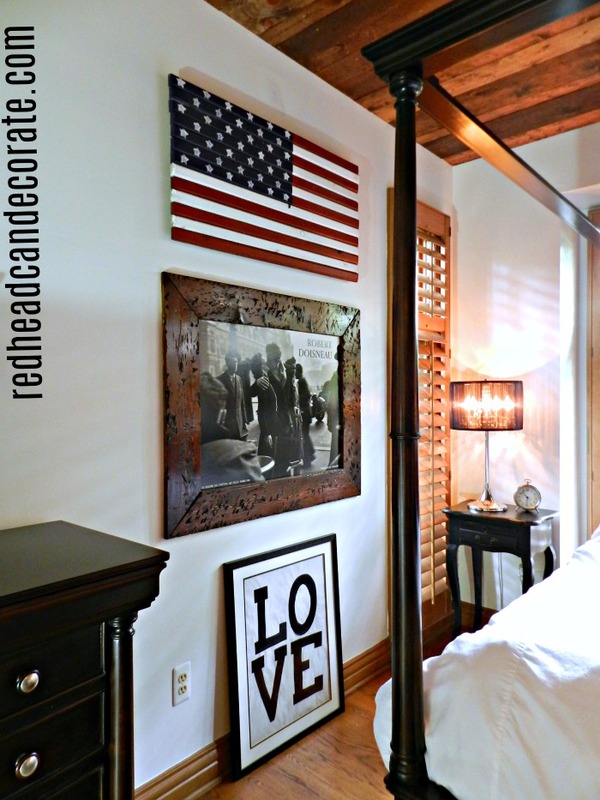 It’s been on our front porch, our garage, and now I finally came to my patriotic senses and realized how beautiful it would look in our master bedroom up against all of the rustic stained wood and white walls. 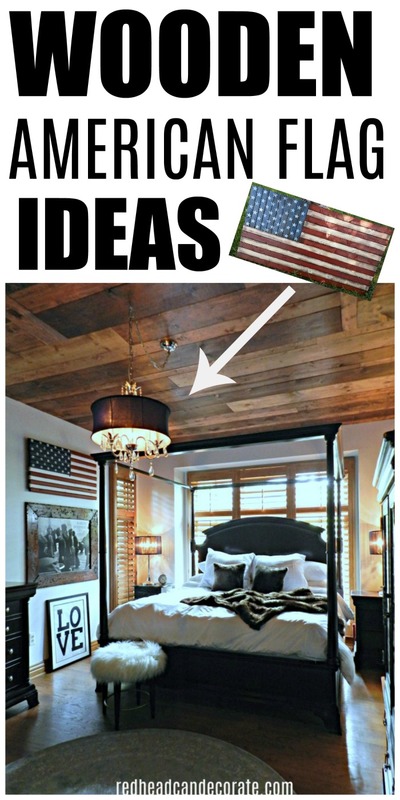 Here…take a peek for yourself, and tell me what you think of our “Patriotic Master Bedroom”. Some of the links in this post may contain affiliate links for your convenience. Read full disclosure policy here. Do you happen to remember what I use to have up there in place of the wooden flag? 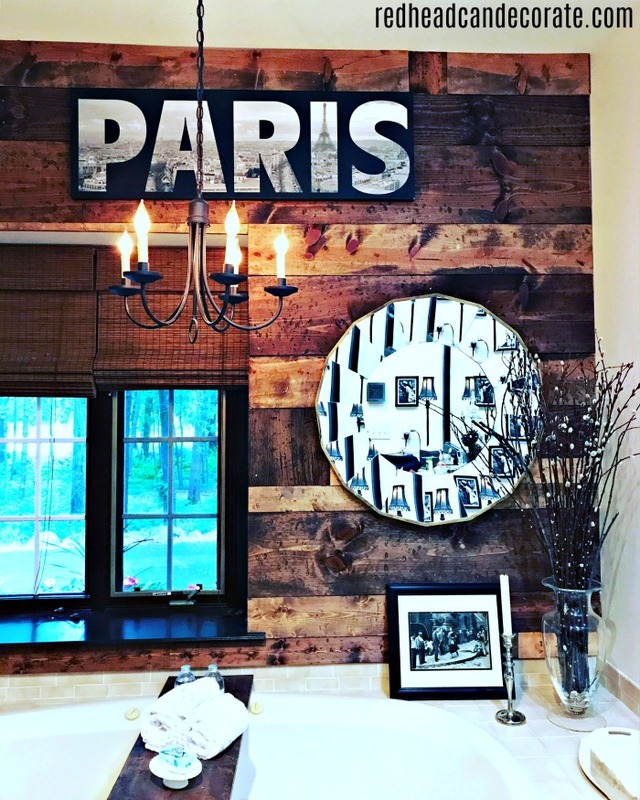 Remember the black and white canvas PARIS sign? Well, that now has a new home in our master bathroom. It looks super cool in there. Here’s a photo I took using my phone, so the lighting is a bit off, but you get the idea. I really like it in here . I have a few more black & white pieces hanging, so it really fits in nicely. 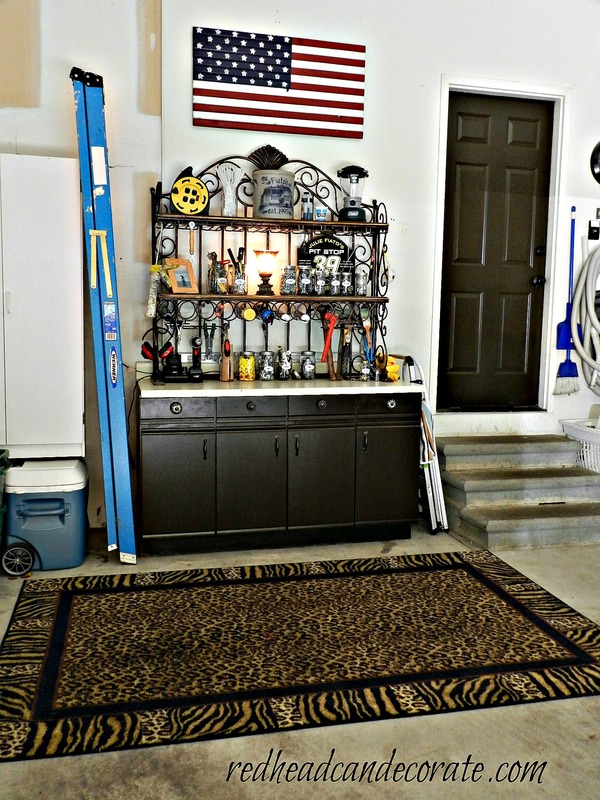 Oh, and here it is in our garage over the “Hutch Turned Tool Bench”. I was storing it there, but it did look nice. 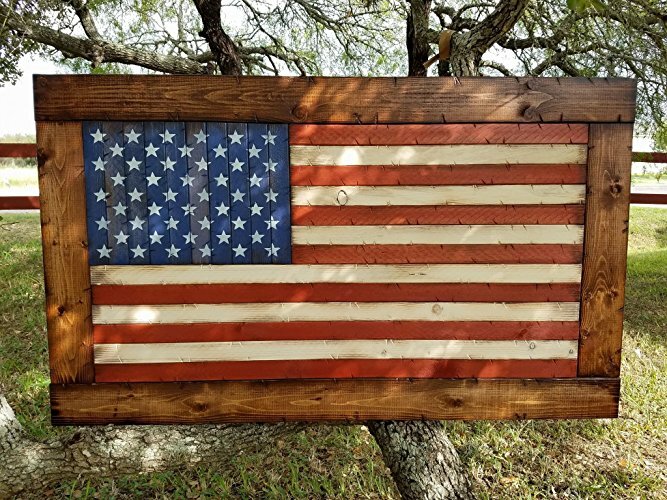 So, I’m very curious to know where do you like it best and would you like to display a wooden rustic American flag in your home? If so, I researched a little and found some great options for you to sift through below. Just click the blue links to see the full size and pricing. I hope you all have a wonderful Fourth of July holiday, I will be taking a much needed break from blogging until July 7th. 🙂 Stay tuned for a HUGE giveaway and a bathroom update all coming up in July. Glad to hear you’ll be taking some time off, we all need that now and then. You work so hard with tour blog you deserve time away. 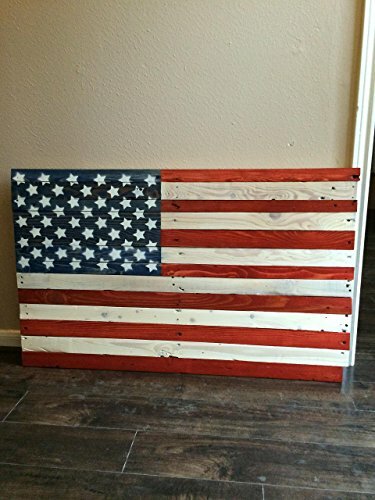 Love your wooden flag, is quite similar to one I made couple years ago. Ours has been hanging on front of our front porch since it was made, is still in very good condition considering it gets snowed and rained on. Did you make yours? While making it got out a flag to compare to make it as original as possible. 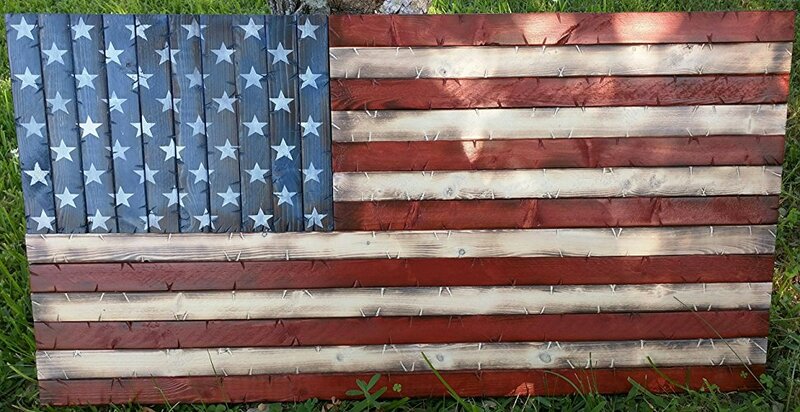 Love flag examples you featured, have been hunting for crib bottom for ages. Hope you have special time off. Hi JaneEllen! I didn’t make it, I bought it about 10 yrs. ago. Hope you have a relaxing holiday, too my friend!! ? There’s one hanging on my front porch already that I never get to see, so now I am greeted with this one every morning. Definitely not hiding, lol! 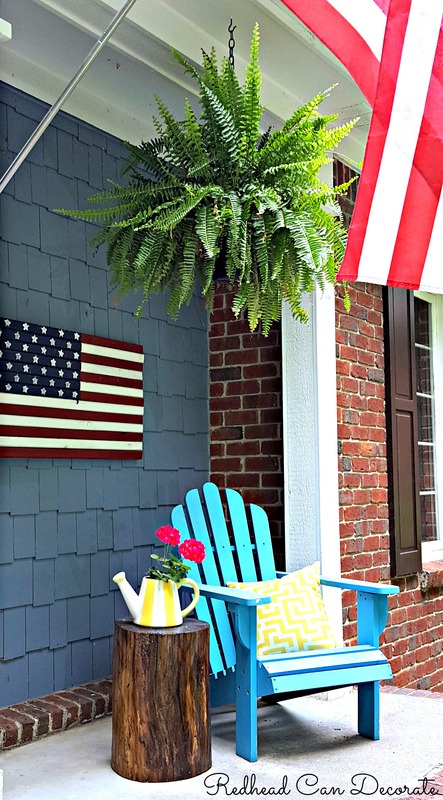 That wooden flag would look great on my front porch. I’m lovin’ the Paris sign, too. …a tweak here, a tweak there…LOL It’s fun!!! Have a great weekend. Happy Fourth of July ????????. Love it in the bedroom. Have fun and enjoy the day. Oh, thanks so much Rhonda! Enjoy your day, too! Love your flag. Thank you for sharing. Happy 4th of July! Looks great! Love the look and so much fun! Way yo go! Thanks, Kyle! Have s great day! Happy 4th of July to you. We keep ours flying on a pole in the front of the house almost year round. It gets so darn windy out by us though so sometimes we need to take it down. Ann you are so funny. This was on a really good day. That tool bench is pure dust right now and not so organized. I call my husband the scatterer. He scatters everything and then I put it back. It keeps us moving lol ? 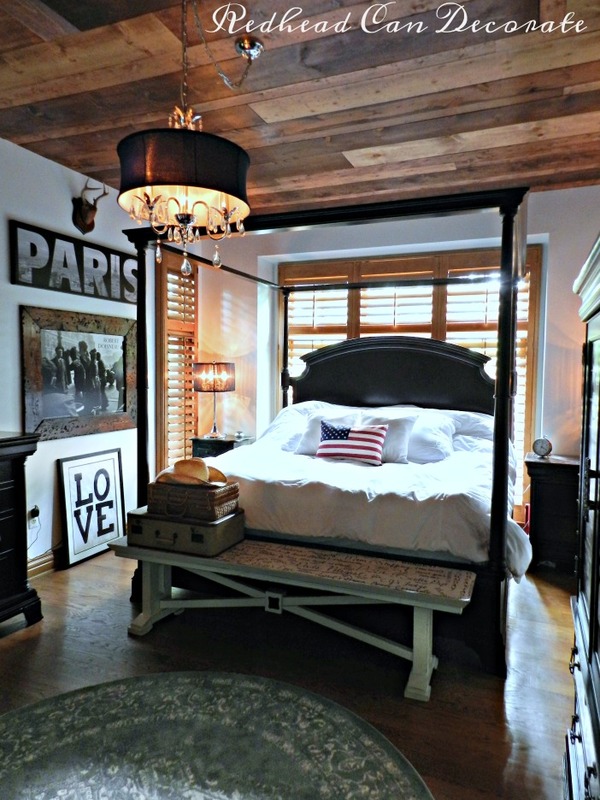 I would love to know all about those shutters in your bedroom. They look great! Love reading your blog. Hi Diane! We ordered those through Home Depot about 10 yrs ago. They install. I love them!! Awww, thank you for that, Barbara! 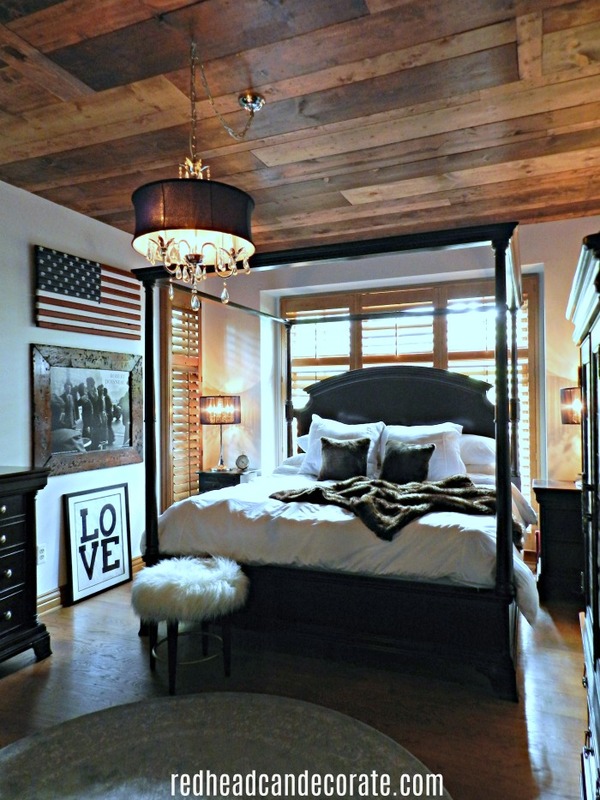 Love the flag in your bedroom; love it anywhere actually. My hubby just hung a new flag on the flagpole in our front yard. Old one was getting tattered; needed replacing. 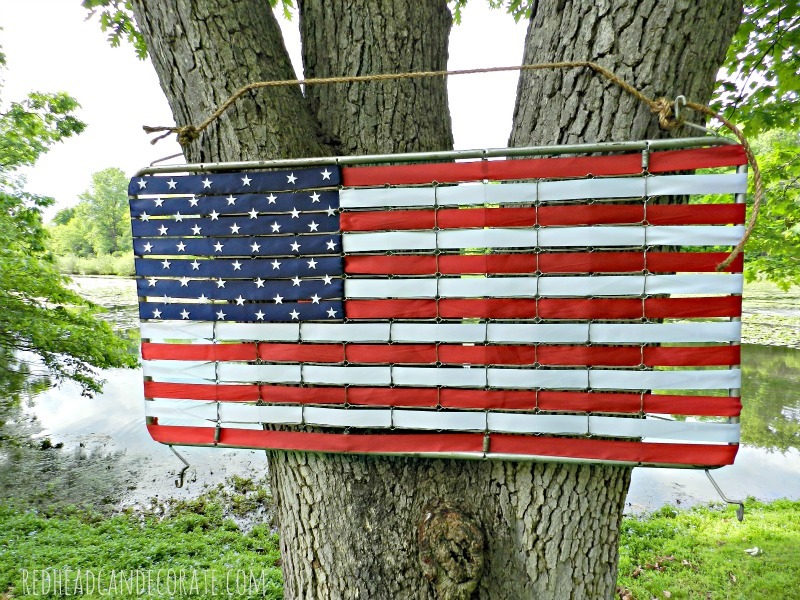 I love the red, white, and blue waving in the breeze. Indoors is wonderful too; we should all be proud to display it in our everyday décor. 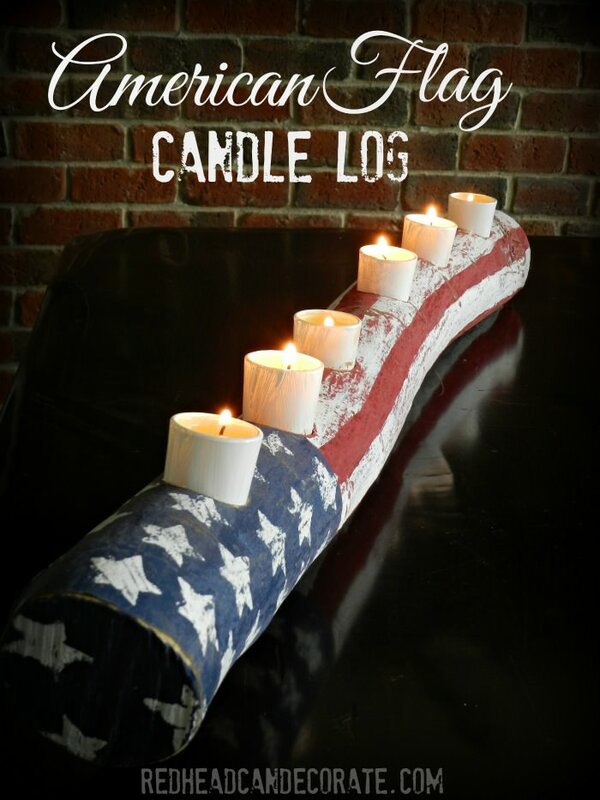 You and your family have a wonderful 4th of July. You did good, love, Dad in NY.